Pamela A. Davol, 76 Mildred Avenue, Swansea, MA 02777-1620. "Growing pains" are symptoms most often affecting medium, large, and giant breeds of dog: those breeds that are usually subjected to rapid growth periods within their first year of development. Symptoms of pain and lameness can be the result of any trauma to bones, joints, or the supporting soft tissues, but often they are caused by specific diseases of the bone. 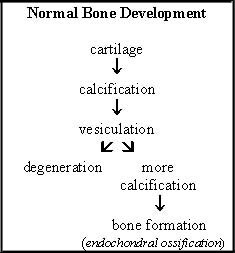 During normal growth and development, cartilage growth precedes bone formation. The cartilage grows and becomes calcified. Vessels from the bone marrow invade this calcified layer of cartilage. Some of the calcified cartilage is resorbed, but some remains and is used as a framework for the bone. In instances of bone disease, one or more of these steps is interrupted and the formation of bone ceases or causes a defect if bone formation continues. Exposure of incompletely formed or abnormally formed bone to pressure and tension resulting from movement causes symptoms of pain and lameness. It is important to understand that "growing pains" are a symptom and do not constitute a diagnosis. For proper treatment of bone disease and prevention of further bone damage leading to secondary complications of osteoarthritis, it is essential that the underlying cause of pain and lameness be identified. How are bone disorders diagnosed? There are multitudes of disorders that may present symptoms of joint pain and lameness in growing, active dogs. Observation of clinical symptoms and physical examination alone, therefore, are not sufficient to accurately diagnose growth-associated disorders. Survey radiography (x-ray imaging) is often reliable for the identification and differentiation of many bone and joint disorders. Often, however, particularly in the early stages of disease, radiographic evidence of bone changes associated with a disease process may be minimal or absent despite clinical symptoms. Additionally, some joint abnormalities are not clearly discerned by conventional x-rays. Therefore, in the presence of significant pain and lameness despite negative findings on x-ray, computed axial tomography (CT) or magnetic resonance imaging (MRI) is often successful in detecting bone and joint abnormalities that are overlooked by survey radiography. Additionally, CT and MRI are considered invaluable for pre-operative planning in cases where corrective surgery is indicated. Another approach that may be used alone or in combination with diagnostic imaging is the laboratory collection and analysis of joint fluid from the effected limb. This method may be helpful in confirming presence of joint disease even in the absence of detectable disease by imaging techniques. Additionally, joint fluid analysis will discern between inflammatory and non-inflammatory joint disease, as well as detect presence of a bacterial infection. However, a major limitation of joint fluid analysis is that it is unable to differentiate between one inflammatory or non-inflammatory disorder and another. There is no single factor that has been identified in causing any of the various bone diseases, rather, certain "risk factors" are attributed to increased occurrence of these disorders in dogs. Size is widely considered a predisposing risk factor. Dogs of large and giant breeds undergo a more rapid growth phase during their first year of development putting them at greater risk for skeletal abnormalities. Excessive calcium supplementation and rapid weight gain are also considered risk factors, however, evidence supporting a role of other nutritional factors such as high protein or carbohydrate diets is not as strong. Additionally, clinical data suggests that the role of nutrition in the development of the various skeletal diseases is more of a modulating effect. In other words, controlling for nutrition alone will not prevent these diseases, rather nutritional management may lessen the severity of disease in those dogs predisposed by other factors such as size, genetics, trauma or as of yet unknown causes. What are some of the common bone disorders affecting dogs? The most common bone disorders affecting growing dogs will be described here. The disorders have been divided into two groups: 1) those in which one or more stages in the construction of bone is interrupted and 2) those affecting the actual formation of bones and joints. 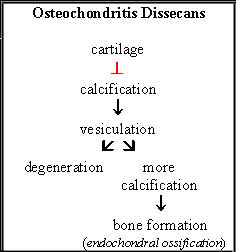 Osteochondritis Dissecans (OCD): This disorder occurs when calcification does not follow cartilage growth. The cartilage continues to grow, becomes thicker than normal, and vessels from the bone marrow are unable to penetrate. Under these conditions, bone formation does not proceed and cracks and crevices form in the abnormally thickened cartilage. Fragments of cartilage eventually detach from the underlying cartilage and become lodged within the affected joint. Affected joints, listed from most to least commonly involved, are the shoulders, knees, elbows, hocks, and rarely the joints of the spinal column. Males have a higher risk than females for developing OCD. Cause: Several factors are indicated in the development of OCD including nutrition, rapid growth, joint conformation and genetic predisposition. In regard to genetic predisposition, certain instances of OCD are suspected of being inherited as a polygenic trait since common OCD lesions are frequently found among littermates. This is particularly the case in elbow dysplasia. OCD is also suspected of playing a role in the development of certain hip dysplasias, but it is not known with certainty whether the presence of OCD lesions is a cause or effect of the various changes taking place within the hip joint. Symptoms: OCD presents as persistent, mild to moderate lameness that usually progresses in severity over time. Symptoms are most obvious immediately after rest periods when the dog first attempts to get up and walk. Joint swelling may or may not be evident, however, hyperextending the affected joint will almost always elicit an unmistakable, often vocal, pain response from the dog. Though lameness may only appear to present on one side (unilateral), asymptomatic OCD will usually be found in one or more joints of the opposite extremity (bilateral). Diagnosis: Survey radiography is often reliable for identifying lesions associated with OCD. Though free-cartilage in the joint-space is not consistently evident on x-ray, bone irregularities and widening of the joint-space are consistent with a diagnosis of OCD. In advanced cases, evidence of degenerative joint disease may also be observed on the x-ray. Treatment: Treatment for OCD may be non-surgical or surgical. Conservative treatment includes weight control and exercise limitation combined with administration of non-steroidal anti-inflammatory drugs [NSAIDs] (ex. buffered-aspirin, carprofen, or etodolac) to reduce pain and inflammation, and chondroprotective drugs (ex. polysulfated glycosaminoglycans, glucosamine, or chondroitin sulfates) to limit cartilage damage and degeneration. Surgical treatment now commonly utilizes arthr oscopy, a microsurgical procedure that is minimally invasive, to remove loose and diseased cartilage. Clinical data suggests that both conservative and surgical methods have been effective for treatment of OCD. No long-term follow-up to compare dogs treated by either approach, however, has yet been conducted. Dogs treated by either method eventually do develop progressive osteoarthritis. In light of significant improvement observed in dogs treated surgically compared to untreated dogs, many orthopedic specialists consider surgery to be the primary treatment for OCD. Surgical intervention is strongly indicated when non-surgical treatment fails to produce improvement in symptoms within 6-8 weeks or radiographic evidence suggests that lesions are becoming more severe despite conservative therapy. Prognosis: Mild to moderate OCD lesions may heal spontaneously with 4 to 6 weeks of crate rest and leash walking. More severe OCD lesions or those occurring in dogs whose owners are unable to enforce exercise restriction usually require conservative or surgical therapeutic intervention to reduce secondary and long-term complications associated with osteoarthritis. Untreated, advanced lesions or those that do not respond to conservative therapy usually require surgical intervention to inhibit progression of debilitating disease. Hypertrophic Osteodystrophy (HOD): When calcified cartilage fails to be penetrated by vessels from the bone marrow, the unvesiculated tissue dies. Excess mineralization takes place resulting in calcium deposits at the affected sites. The radius and ulna bones of the forelimbs and the tibia bone of the hind limbs are all affected in dogs with HOD. Males and females are equally at risk for developing HOD. Cause: Results from early studies suggested improper nutrition in the form of over-supplementation leading to imbalance of the calcium:phosphorous ratio or dietary deficiency of vitamin C as factors contributing to the development of HOD. Though overnutrition is still one factor accepted as playing a role in HOD, vitamin C deficiency has been ruled out as a contributing factor. Additionally, there is evidence to support a viral or bacterial infectious agent, as well as immunizations with multivalent vaccines (see: Orthopedic Disease (Vaccine-induced Hypertrophic Osteodystrophy; HOD) in "Vaccines, Infectious Diseases and the Canine Immune System") as playing a role in this disorder. Symptoms: Lameness associated with HOD comes on suddenly, lasting for 2-3 weeks at a time with symptoms recurring throughout cycles of growth. Pain occurs in all four limbs at the same time, therefore, the dog is reluctant to move and will spend most of the time laying down. When the dog does stand up, he may stand with his back arched and all four limbs tucked under his body. Intermittent fevers (sometimes above 104� F), lethargy, and loss of appetite are other symptoms associated with HOD. Bone swelling and conformational abnormalities may also occur in advanced cases of HOD. Examples of the latter would include hyperextension of joints (such as "double-jointed hock") and angular deformities in the bones of the lower limbs. Diagnosis: Survey radiographs are reliable for identifying bone abnormalities associated with HOD. Extensive evidence of irregular, new bone formation along the shafts of the bones, bone thickening at the ends of the bone shafts, and swelling of the surrounding soft tissue are the most common findings on x-ray. Additionally, areas of mineralization are sometimes observed. An important note in the diagnosis of HOD is that these radiographic lesions should appear on more than one limb, otherwise a differential diagnosis of osteomyelitis, a bone infection caused by bacteria or fungi, must also be considered. Osteomyelitis occurs when infectious microorganisms gain access to the bone commonly through bite wounds or other penetrating wounds. Symptoms and radiographic lesions of osteomyelitis are common with those of HOD. Treatment: Correcting nutritional imbalance, through discontinuation of supplementation and reduction of caloric intake, is usually the first step in providing treatment for HOD. Though administration of vitamin C (ascorbic acid) was once a common therapy for HOD, other clinical findings contraindicate the use of vitamin C in the treatment of HOD since it was found to inhibit the normal process of bone resorption. Thus, administration of vitamin C may further exacerbate abnormal bone development associated with HOD. To date, the most effective therapies include administration of corticosteroids and antibiotics. Prognosis: Unfortunately, dogs diagnosed with HOD do not respond consistently to therapy, therefore, long-term prognosis remains guarded. 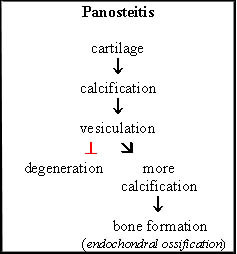 Panosteitis: This disorder occurs when the normal process of bone degeneration and resorption fails to occur. As a result, there is an excess formation and thickening of bone. This condition most commonly affects the long bones of either the front (humerus) or hind (femur or tibia) limbs. Males have a higher risk than females for panosteitis. Cause: The inflammatory process responsible for panosteitis is poorly understood, however, overnutrition and rapid growth are factors widely accepted as playing roles in the development of this disorder. Symptoms: Panosteitis is characterized by a sudden onset of intermittent lameness that may last for a few days or several weeks with the possibility of recurrence throughout cycles of growth. The lameness may be mild to moderate, may shift from one limb to another, and is unaffected by rest or exercise. Applying pressure to the bone-shaft of the affected limb usually produces an evident pain response. Lethargy and loss of appetite may also occur. In dogs with frequent recurrence or persistence of symptoms, there may be muscle atrophy of the affected limb. Diagnosis: Radiographic evidence of panosteitis will be absent in early or mild cases of the disorder. In more advanced or moderate cases, areas of increased bone density within the shaft of the affected bone will be evident on x-ray. Treatment: Corticosteroids, buffered-aspirin or non-steroidal anti-inflammatories may be used to reduce pain but have not otherwise been reported to noticeably influence the course or outcome of the disease. Prognosis: Panosteitis resolves itself and symptoms usually cease by the time the dog reaches 18-24 months of age. Elbow Dysplasia: Elbow dysplasia is a broad term used to describe an improper formation of the elbow joint often presenting with persistent, progressive symptoms and leading to severe arthritic inflammation (osteoarthritis) and eventual degeneration of the joint. Four forms of elbow dysplasia have been identified and include 1) ununited anconeal process (UAP), 2) fragmented medial coronoid process (FMCP), 3) osteochondritis dissecans (OCD) of the medial condyle of the humerus, and 4) incongruity (IC). OCD of the elbow joint occurs as a result of abnormal bone construction and therefore, is described in detail in the prior section of this article. Structural abnormalities of the elbow joints include UAP, FMCP, and IC. These disorders have been attributed to asynchronous growth of the radius and ulna (the lower bones of the front limbs equivalent to the forearm bones of humans). When one of these bones grows more rapidly than the other at the end of the bone shaft composing the joint of the elbow, there occurs abnormal weight bearing on the opposite bone. This increased stress increases risk for abnormal bone formation, fragmentation of cartilage, and erosion of joint cartilage. UAP is believed to occur when the radius grows longer than the ulna. FMCP has been attributed to increased length of the ulna compared to the radius. IC occurs when there is abnormal alignment of the bones of the elbow joint because of asynchronous bone growth. Therefore, IC often occurs concurrently with UAP and FMCP. Other possible causes for these disorders include absence in the development of normal curvature of the ulna (UAP); delay in the steps leading to bone ossification which increases risk for cartilage fragmentation (FMCP); and malformation of the area of the ulna involved in formation of the elbow joint (IC). Cause: It is widely believed that structural bone abnormalities occur secondary to the abnormalities in bone formation described in the previous section of this article. As such, factors including rapid growth, improper nutrition, and genetic traits that predispose to formational abnormalities also increase risk for structural abnormalities. In terms of nutritional factors, it has been found that nutritional management alone will not completely prevent risk of structural bone abnormalities. Nutrition does, however, have a direct effect on frequency and severity of occurrence in genetically predisposed dogs, particularly during rapid periods of growth. Clinical evidence now strongly supports incidence of elbow dysplasia as being inherited as a polygenic trait in a number of breeds including the Labrador Retriever, Bernese Mountain dog, Rottweiler, German Shepherd dog and Bassett Hound. The fact that frequency of elbow dysplasia has now surpassed frequency of hip dysplasia in some breeds further supports the idea that clinical screening and controlled breeding are necessary to reduce incidence of elbow dysplasia in the breed populations. Symptoms: In the early stages of the disorders, all four conditions have the same symptoms: stiff gait during the first few minutes after rest. Eventually, front limb lameness is presented as a slightly stiff, stilted gait. The dog will hold his elbows close to his chest. A painful response is often observed when the elbows are extended or flexed. In advanced cases where degeneration of the joint has begun, swelling, muscle atrophy and joint crepitus is often observed. Diagnosis: Survey radiography is capable of detecting elbow dysplasia associated with UAP as early as 4-5 months of age when symptoms are first noted. Radiographic abnormalities produced by the other disorders are often rarely discernable and when they are, they are usually not observable until 8 months of age. In clinical comparisons, CT and MRI provided a more sensitive and accurate means for diagnosing UAP, FMCP, and OCD than conventional x-rays. Radiographs are rarely useful for diagnosis of IC, therefore, CT or MRI is also recommended for assessment of IC. Bone scans and joint tap, though not definitive diagnostic techniques for elbow dysplasia, may assist in identifying a source of lameness to either the bone, joint or soft tissue. In the absence of definitive lesions by diagnostic imaging techniques, arthroscopy is often utilized to observe the affected joint for the purpose of identifying occult joint disease. Treatment: Surgery is widely considered the best option for elbow dysplasias associated with UAP and OCD. Dogs treated early in the course of the disease when there is only minimal osteoarthritis exhibit the best long-term outcome in terms of reduction of symptoms and restoration of activity. However, despite surgical intervention, most of these dogs will develop progressive osteoarthritis and likely require long-term therapy with non-steroidal anti-inflammatories and/or chondroprotective drugs. Clinical data on the surgical treatment of FMCP has thus far demonstrated no significant gains over non-surgical treatment for this condition. Treatment alternatives to surgery include rest, weight reduction, low-impact exercise, and drug therapy with non-steroidal anti-inflammatories and/or chondroprotective drugs. No comparison studies between surgical and non-surgical treatment for IC has yet been conducted. When surgical intervention is selected, arthroscopic surgery to correct bone malalignment has proven a successful surgical option. Prognosis: Progression of disease and outcome of treatment is dependent upon the individual dog. In general, dogs diagnosed with elbow dysplasia are expected to exhibit a fair to good outcome. Secondary osteoarthritis is an expected complication of elbow dysplasia. Despite this, both non-surgically and surgically treated dogs adjust to their disease through self-limitation of activity while still leading functional lives. Working dogs, however, may be significantly limited in their performance ability. Likewise, dogs with severe, progressive osteoarthritis or joint degeneration refractory to drug treatment may become significantly debilitated. Hip dysplasia (HD): Hip dysplasia is a term widely used to describe any one of a number of conditions that bring about abnormal formation of the hip joint eventually resulting in mild to severe osteoarthritis and joint degeneration. The primary cause of hip dysplasia is attributed to muscle laxity during growth. During this period, the pelvic muscles must hold the ball of the thighbone (femur) into the socket of the pelvis (acetabulum) for proper formation of the joint. If muscle tone is inadequate, or if bone growth proceeds at a faster rate than muscle development, the femoral head pulls away from the acetabulum, a process known as subluxation. Subluxation leads to abnormal wear and erosion of the joint cartilage. As a result, there is flattening of the femoral heads and shallow development of the acetabula. This improper fit of the ball and socket of the joint creates additional friction and cartilage erosion that leads to secondary osteoarthritis. Age of onset: 8-12 months; earlier in severe cases. Some afflicted dogs may never show clinical symptoms. Cause: Like elbow dysplasia, there is no one factor considered responsible for the development of HD. Considerable evidence suggests a polygenic basis for inheritance of HD with certain risk factors playing a substantial role in degree of expression. These risk factors include size, muscle mass, growth rate, overnutrition, electrolyte imbalance, and hormonal influences during gestation. Clinical evidence suggests a strong correlation between muscle laxity and development of HD independent of environmental factors. Therefore, a new method for screening breeding stock, the PennHip distraction index (DI) has been proposed as a more accurate means than the Orthopedic Foundation for Animals (OFA) method. This is because the PennHip method entails an objective measurement of muscle laxity in comparison to the OFAs subjective evaluation, in which results may be dependent upon a number of external variables, for predicting genetic predisposition for HD. Symptoms: Symptoms of HD vary from dog to dog. Early signs are usually observed as abnormalities in the dog's gait: the dog may exhibit a swaying gait when walking and may "bunny hop" on the hind limbs when running. Many cases of severe HD exhibit very few clinical signs. Many dogs compensate for hind limb abnormalities by shifting most of their body weight to the front end. As a result, dogs showing few clinical symptoms may develop increased shoulder musculature ("loaded shoulders") while hind limb musculature remains under-developed. As damage to the joint progresses and secondary osteoarthritis sets in, symptoms of stiffness and lameness may present. Diagnosis: Survey radiography is usually accurate for the diagnosing HD in dogs presenting with clinical symptoms. However, HD may occur concurrently with a number of other skeletal, muscular and neurological disorders. Often a dog presenting with recent symptoms of hind limb lameness and indications of advanced hip osteoarthritis on radiographs will be found to have lameness associated with knee ligament (cruciate ligament) disorders rather than HD upon closer scrutiny. Therefore, radiographic evidence of HD alone is not sufficient to conclude that symptoms are directly associated with HD, and a complete physical exam and history of the dog is required to rule out other disease processes. In terms of genetic selection against HD, x-ray only demonstrates actual appearance (phenotype) of hips at one given point in time, therefore, there are limitations to this method's predictive value in terms genetic assessment for HD (see "Canine Hip Dysplasia: Are Breeders Winning the Battle?"). For example, many dogs that pass radiographic OFA standards for absence of HD at two years of age may go on to develop HD later in life and therefore, should still be considered genetically predisposed to HD. Measurement of muscle laxity as early as 4 months of age using the PennHip DI score has been clinically shown to provide an accurate predictive assessment for dogs with low risk (DI� 0.4) for HD or dogs with high risk (DI > 0.7) for developing HD sometime within their lifetimes. Scores between 0.4 and 0.7 at this age, however, are less reliable for predicting risk and require reassessment of DI at 6 to 12 months of age. Treatment: Treatment of HD is dependent on several factors and may be conservative or surgical. In deciding upon the course of treatment, factors to consider include the dog's tolerance and/or ability to adapt to the disorder, rate of progression of osteoarthritis and joint degeneration, and cost for treatment. Many dogs are capable of living normal lives despite HD provided that they are allowed to choose their own level of activity. Improvement and even disappearance of symptoms is common. In such instances, moderate exercise is encouraged to prevent muscle atrophy that may contribute to further subluxation, possible dislocation, and more rapid progression of joint degeneration. Forced, sudden activity or jumping should be discouraged. Non-surgical therapy includes administration of non-steroidal anti-inflammatories and/or chondroprotective drugs. Surgical intervention is usually indicated in cases of gross malformation or where joint degeneration proceeds at an accelerated rate resulting in severe disability. There are several surgical procedures that have been developed for the treatment of HD. Direct clinical comparisons of long-term outcome for each method, however, have not been conducted. Despite this, clinical reports on the various methods indicate a positive response to surgical intervention in terms of slowing joint degeneration, increasing activity tolerance and/or the reducing symptoms. The simplest of these procedures, pectineus tendonectomy, entails severing the pectineus tendon of the leg thereby releasing tension on the hip joint. This allows for greater abduction in weight bearing and alleviation of symptoms in some HD-afflicted dogs. This method, however, does not inhibit progression of joint degeneration, and therefore, may not be the best procedure for treating dogs exhibiting accelerated joint-degeneration. Pelvic osteotomy is another method aimed at reducing stress on the hip joint. This procedure depends on repositioning the acetabulum so that it provides support to the leg bone and thus prevents subluxation. This is usually accomplished by rotating the acetabular roof over the femoral head. High success rates have been reported for long-term outcome on dogs treated by this procedure. Additionally, recovery time is brief, and because dogs can undergo surgery on both hip joints at the same time, secondary complications related to stress on the untreated hip during recovery are not problematic. A third method, resection arthroplasty, entails complete removal of the femoral head to alleviate the source of pain. This procedure, however, has its limitations particularly in larger dogs where it was found that the weight of these dogs caused the top of the bone shaft (from which the femoral head was excised) to hit against the pelvis during exercise and produce another source for pain and symptoms. Therefore, in larger dogs that had originally undergone this surgical treatment in the past, a second surgery to improvise muscle support to the initial surgical site was required to correct this problem. The fourth procedure, total hip arthroplasty, entails fitting and insertion of an artificial hip joint. Drawbacks to this procedure, include high cost and increased risks for secondary complications. Additionally, concern has been raised about long-term functional life of the prosthesis and the potential for cement disease: issues that plague hip replacement in human medicine. Despite these issues, total hip arthroplasty is widely considered to be the best treatment for HD in regard to long-term patient outcome and control of joint degeneration. Prognosis: Dogs afflicted with HD showing mild to moderate evidence of joint degeneration are considered to have a good prognosis with either conservative or surgical treatment methods. Often, severity of joint degeneration may not be evident by observing symptoms alone, however, and joint deterioration may progress in the absence of clinical symptoms. In cases demonstrating significant progression of joint disease, it may be anticipated that at some point, these dogs may not be sufficiently managed by conservative therapy alone. Surgical intervention then becomes a viable option for restoring normal function and activity. The key to prevention of the various growth-associated bone disorders lies in the attempt to control for both genetic and environmental risk factors that may increase susceptibility. As discussed earlier in this article, proper nutrition of growing puppies in the form of restricted feeding through avoidance of high-calorie diets and oversupplementation are steps in prevention from an environmental perspective. Another potential method for reducing incidence in dogs known to be at higher risk for developing growth-associated skeletal disorders may be through administration of preventative drugs. Much clinical research has focused recently on the use of disease-modifying osteoarthritis drugs (DMOADs), also called chondroprotective drugs, that claim to prevent, reduce or reverse the degeneration of cartilage resulting from joint abnormalities. From a genetic standpoint, in cases of bone disorders suspicious or known to have genetic transmittance, selective breeding to eliminate affected dogs from the gene pool is one step in reducing occurrence in future generations. Several methods for genetic screening have been developed specifically for this purpose. By the time symptoms of bone disorders occur, changes in the cartilage have already taken place. Non-steroidal anti-inflammatory drugs (NSAIDs) may help to quickly improve pain and inflammation secondary to cartilage damage and erosion. Some evidence suggests that they may also slow down the processes related to cartilage degeneration. Buffered aspirin is probably the most widely used NSAID. However, long-term use of aspirin, itself, has been implicated in damaging cartilage in both normal and diseased joints. Though this finding should not deter use of aspirin for short-term therapy of symptoms, because many dogs with joint disease may require long-term administration of therapy, aspirin would not be considered a suitable treatment option in such cases. Carprofen (Rimadyl) and etodolac (Etogesic) are alternative NSAIDs to aspirin that have been approved for use in dogs for the treatment of osteoarthritis. These two drugs may have some positive protective properties without the detrimental effects on cartilage. Piroxicam, another NSAID, may also be a potential candidate for treating dogs with osteoarthritis, however, clinical data supporting a protective effect on cartilage has not been consistently demonstrated. As with many drugs, some dogs treated with NSAIDs may develop mild to severe reactions following drug administration. Potential complications associated with administration of these drugs, as well as signs and symptoms that would indicate an adverse drug reaction should be discussed with the attending veterinarian. Complex sugars are another class of drugs that have been recognized for their efficacy in treating and possibly even preventing degenerative joint disease. Polysulfated glycosaminoglycan (PSGAG), the major component of which is chondroitin sulfate, is a DMOAD and has been used in Europe since the 1960s. One form of this drug, Adequan, has recently been approved for use in dogs in the United States. Research indicates that this drug not only biochemically interacts with cartilage and other tissues of the joints, but also increases concentration of joint lubricant. In a study exploring a potential prophylactic effect for PSGAG, young dogs predisposed to HD and administered PSGAG demonstrated significantly better hip joint conformation than untreated dogs. However, subsequent clinical trials to examine the beneficial effects of PSGAG in dogs, in terms of reducing symptoms and slowing joint degeneration, have demonstrated no significant impact on disease progression. Despite this, because clinicians have observed improvements in dogs on an individual basis, some recommend early prophylactic treatment with PSGAG for dogs with high risk for disorders such as OCD, elbow dysplasia and HD. Additionally, some orthopedic surgeons will treat dogs with PSGAG beginning 7 to 10 days after joint surgery. Health complications have been reported for PSGAG and are mostly related to the potential for serious side-effects when PSGAG is administered to dogs with a history of bleeding disorders, shock or hypersensitivity. Neutraceuticals of PSGAG are available without prescriptions. These products are not in the same purified and/or modified form as their federally controlled counterparts. For example, neutraceuticals do not contain the direct-acting molecules that are PSGAGs, but rather may contain a precursor to the active form of the drug. Therefore, a neutraceutical molecule must undergo a biochemical reaction once absorbed by the body to become active and effective. This requirement can produce much limitation on extent of effectiveness. Because of this, however, these products are considered nutritional supplements and do not require approval for use. Common PSGAG-like neutraceuticals include Glycoflex and Cosequin. These drugs appear relatively safe with no toxic side-effects, however, there is no evidence to date that suggests they biochemically interact with the joint tissue or increase cartilage integrity as found with PSGAGs. Nor have clinical trials with proper controls been conducted to substantiate claims for improvement of joint symptoms in dogs treated with these neutraceuticals. In absence of scientific evidence to support benefits of use in dogs with joint disease as well as the high cost of these neutraceuticals, clinicians recommend that if improvement of symptoms is not observed 6-8 weeks after treatment is started, treatment should be discontinued and alternative therapies considered. Pentosan polysulfate (PPS) is another complex sugar classified as a DMOAD. PPS is currently undergoing pre-clinical testing in dogs in the United States but has not yet been approved for clinical treatment of dogs. PPS interacts with joint tissues similar to the biochemical mechanisms observed for PSGAG and, similarly decreases cartilage degeneration associated with osteoarthritis. In one study, dogs diagnosed with elbow dysplasia were treated with either PPS or surgery. No difference in long-term functionality was observed between the two groups, but in short-term comparisons, the PPS group's functional improvement occurred sooner following the onset of treatment compared to the surgery group. Despite these promising results, further studies with PPS are required to substantiate its clinical benefits in dogs. Complications associated with PPS are few but include potential for development of blood clots. Hyaluronan is a slow-acting drug that provides long-term benefits related to pain relief and restoration of function. Pre-clinical testing to determine potential benefits for human patients was conducted in canine models for osteoarthritis. As such, results from these studies suggest that hyaluronan may have clinical benefits for use in dogs. Though clinical trials using hyaluronan to treat osteoarthritis in horses have been conducted, no such trials have been conducted in dogs at the time this article was written. Many breeders, concerned with the physical "soundness" of purebred dogs, have attempted to reduce incidence of skeletal diseases within their breeds' populations. With the knowledge that many developmental bone and joint disorders are genetically transmitted, methods for screening afflicted dogs and eliminating them from the breeding pool have been devised in the hopes of reducing incidence of bone disorders and increasing genetic soundness of future progeny. However, there is strong evidence suggesting that joint disorders such as elbow and hip dysplasias are polygenic: conditions caused by more than one gene. As with all polygenic traits, environmental factors significantly influence the degree of expression and rate of progression of these disorders. These factors are likely responsible for the difficulty encountered when screening breeding stock and applying results to evaluate genetic risk. Certification of breeding stock through the Orthopedic Foundation for Animals (OFA) is currently the most widely used screening method for elbow dysplasia and hip dysplasia. Radiographs of elbows and hips are taken by the breeder's/owner's veterinarian and then submitted to the OFA for review by experts in the field of canine orthopedics. Dogs found to be clear of elbow and/or hip dysplasia will receive OFA number certification in the elbow and/or hip dysplasia registry. For OFA number certification in the hip dysplasia registry, dogs must be at least two years of age at the time the radiograph is taken. Between two and five years of age is the best time for OFA review. Below two years of age it is often difficult to draw the line between what is normal and abnormal in the developing hip joint, and above five years of age, primary arthritis of old age may be impossible to differentiate from slight hip dysplasia. Though the OFA should be viewed as one valuable tool in the control of hip dysplasia, limitations for this method have been identified and suggest why OFA certification alone over the past several decades has not assured freedom of risk for HD in recent generations. The Wind-Morgan program is another genetic screening method, specifically for Labrador Retrievers, that has gained much popularity. In addition to radiographs of elbows and hips, this program also reviews and assesses shoulders, knees, and hocks: other sites frequently predisposed to genetically transmitted joint diseases. This method is proving to be invaluable, particularly for detecting lesions in joints not routinely screened by the OFA. However, like the OFA, the Wind-Morgan evaluation is also based on radiographic appearance of the joint at a particular point in time. Because many joint disorders are not always evident on radiograph, as well as the finding that joint appearance does not necessarily correlate with genetic risk for transmitting joint disorders, Wind-Morgan may have the same limitations as reported for OFA. A more recent and upcoming method of screening specifically for hip dysplasia is the PennHip method. This method uses the distraction index (DI) to measure muscle laxity as an indicator for risk of hip dysplasia independent of factors such as degree of disease expression and rate of progression. The DI measurement is based on the observation that increased muscle laxity in the hip joint is associated with increased subluxation and joint abnormalities. Therefore, dogs with more muscle laxity are genetically at increased risk for developing and passing-on hip dysplasia to offspring even in the absence of radiographic evidence of joint disease. Dogs with DI scores equal to or less than 0.3 are considered at no risk for developing HD throughout their lives. The greater the dog's score is above 0.3, the greater the risk for developing HD. Since average DI scores for many breeds may be well above 0.3, particularly in the large and giant breeds, this method is not advocated for elimination of dogs from a breeding program. Rather, selecting individuals with the lowest DI scores in each generation for breeding has been observed to significantly improve hip conformation within only a few generations. Therefore, the PennHip method used alone or together with either the OFA or Wind-Morgan methods, may provide the best outlook for control of HD in future generations (see "Canine Hip Dysplasia: Are Breeders Winning the Battle?"). Abeles V, Harrus S, Angles JM, Shalev G, Aizenberg I, Peres Y, Aroch I. Hypertrophic osteodystrophy in six weimaraner puppies associated with systemic signs. Vet Rec, 145:130-134, 1999. Budsberg, SC, Todhunter, RJ, McNamara, PS, Jr. Use of chondromodulating drugs and substances in the prevention and treatment of osteoarthritis in dogs. In: Bonagura, JD, ed: Kirk's Current Veterinary Therapy XIII. Philadelphia: W.B. Saunders Co., 1999, p. 1018. Olsson SE. Pathophysiology, morphology, and clinical signs of osteochondrosis in the dog. In: Bojrab, MJ, ed: Disease Mechanisms in Small Animal Surgery. Philadelphia: Lea & Febiger, 1993, p.777. Schrader SC. Differential diagnosis of nontraumatic causes of lameness in young growing dogs. In: Bonagura, JD, ed: Kirk's Current Veterinary Therapy XII. Philadelphia: W.B. Saunders Co., 1995, p. 1171. Schrader, SC. The use of the laboratory in the diagnosis of joint disorders of dogs and cats. In: Bonagura, JD, ed: Kirk's Current Veterinary Therapy XII. Philadelphia: W.B. Saunders Co., 1995, p. 1166. Schulz KS, Payne JT, Aronson E. Escherichia coli bacteremia associated with hypertrophic osteodystrophy in a dog. J Am Vet Med Assoc., 199:1170-1173, 1991. Schwarz, PD. Canine elbow dysplasia. In: Bonagura, JD, ed: Kirk's Current Veterinary Therapy XIII. Philadelphia: W.B. Saunders Co., 1999, p. 1004. Smith, GK and McKelvie, PJ. Current concepts in the diagnosis of hip dysplasia. In: Bonagura, JD, ed: Kirk's Current Veterinary Therapy XII. Philadelphia: W.B. Saunders Co., 1995, p. 1180. Teara JA, Krook L, Kallfelz FA, Hintz HF. Ascorbic acid deficiency and hypertrophic osteodystrophy in the dog: a rebuttal. Cornell Vet, 69:384-401, 1979. "Dog Owner's Guide: PennHip Q & A"
Copyright � 1999, 1992. Pamela A. Davol. All rights reserved. Copyright & disclaimer.